20 The U.S. women’s ice hockey team snapped a 20-year gold-less drought with a 3-2 victory over Canada. The gold medal was the country’s first in the Olympic event since the Nagano Games in 1998, and it ended Canada’s bid for a fifth straight title. Star forward Jocelyne Lamoureux-Davidson feinted three times to fool Canadian goalie Shannon Szabados, before scoring the winning goal in the sixth round of a thrilling shootout. After the game, forward Hilary Knight described the win against their biggest rival as a storybook ending to a series of incredible accomplishments. A year ago, the women were threatening to boycott the world championships over a pay dispute until an agreement was reached at the last minute. “It’s going to be a turning point for women’s hockey in the U.S. (and) I feel like a turning point for women’s hockey in the world,” Lamoureux-Davidson predicted at the time. 2 American David Wise wiped out on his first two runs in the men’s freeski halfpipe final after his bindings failed, then went big with a run that featured double corks spun in four different directions. It paid off. Wise earned a score of 97.20 points to defend his Sochi title and win his second consecutive gold in the event. The silver went to teammate Alex Ferreira, the most consistent competitor of the day who boosted himself more than 20 feet out of the halfpipe. New Zealand’s Nico Porteous shocked himself to take bronze, the second medal of the day for the Kiwis. Earlier, 16-year-old snowboarder Zoi Sadowski-Synnott ended New Zealand's 26-year medal drought with a bronze in women's Big Air. Wise’s gold marked the fifth for the United States in snowboarding -- Shaun White and Chloe Kim in the halfpipe, Red Gerard and Jamie Anderson in slopestyle all took the top spot as well. 2:20.90 What will probably be the only time Mikaela Shiffrin and Lindsey Vonn meet at an Olympic race ended with a fizzle. Mikaela Shiffrin took the silver medal for the Alpine combined but Vonn, who led in the downhill portion, missed a gate in the slalom portion and did not finish the race. Michelle Gisin of Switzerland won with an aggressive slalom and a nearly flawless performance. Her combined time of 2 minutes, 20.90 seconds beat Shiffrin’s by 0.97 seconds. Wendy Holdener of Switzerland took the bronze medal. Shiffrin won a gold medal in the giant slalom a week ago. Vonn completes what will likely be her last Games with one bronze, in the downhill, that earned her the distinction of the oldest woman to win an Alpine Olympic medal. 96 — Austrian Anna Gasser scored a 96 as she edged two-time gold medalist Jamie Anderson in a thrilling final to earn gold in the Olympic debut of women’s big air snowboarding. Gasser stomped her last jump, a “cab double 10” or two flips and three full rotations to earn a 96, the highest of the day, for a total of 185. The reigning world champion had finished a disappointing 15th in the earlier wind-bedevilled slopestyle. 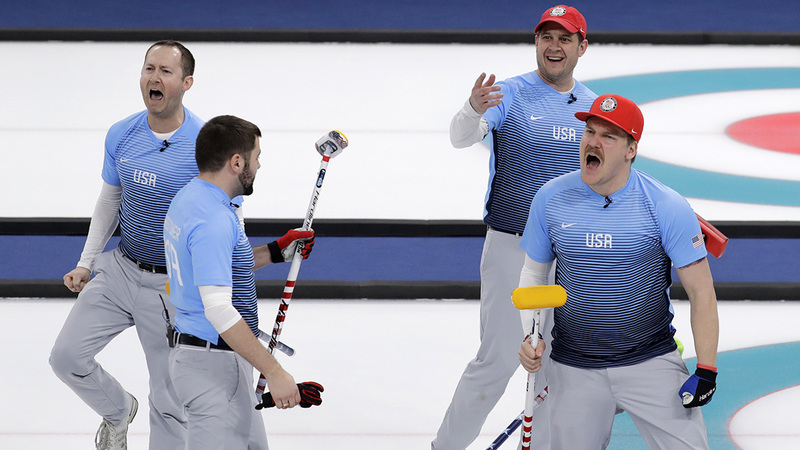 5-3 The U.S. men’s curling team, which has never won an Olympic gold or silver medal, is on its way to the finals after an upset victory against Canada, the three-time defending Olympic champions. The Americans had a three-game winning streak before beating Canada 5-3. The U.S. will face Sweden for the gold while Canada will play Switzerland for bronze. 38 — Years since the the U.S. men’s hockey team pulled off the “Miracle on Ice.” On Feb. 22, 1980, the U.S. upset a veteran Soviet Union squad, 4-3, behind captain Mike Eruzione’s game-winning goal and the play of goaltender Jim Craig. The improbable victory propelled the U.S. team, which consisted entirely of amateur players, to its final game against Finland. The U.S. won that game 4-2 to claim gold.